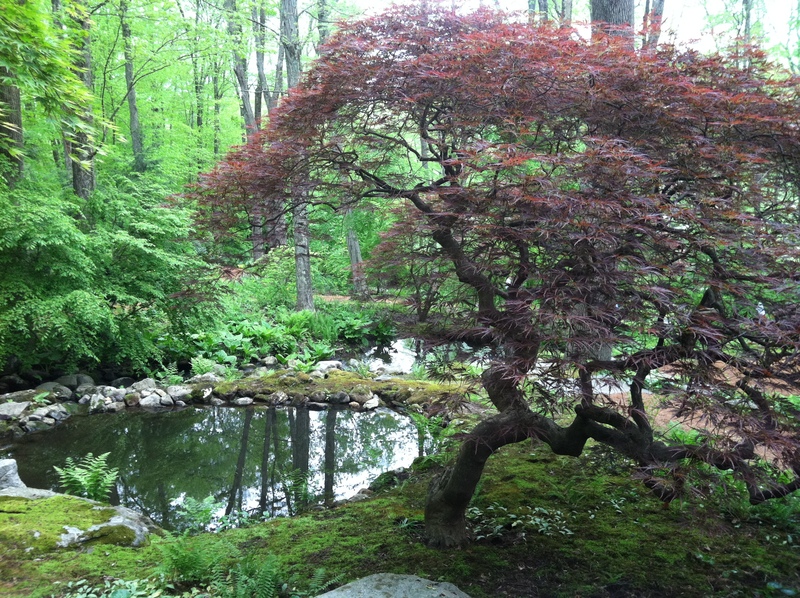 The Garden Conservancy’s Open Days program continues to impress! 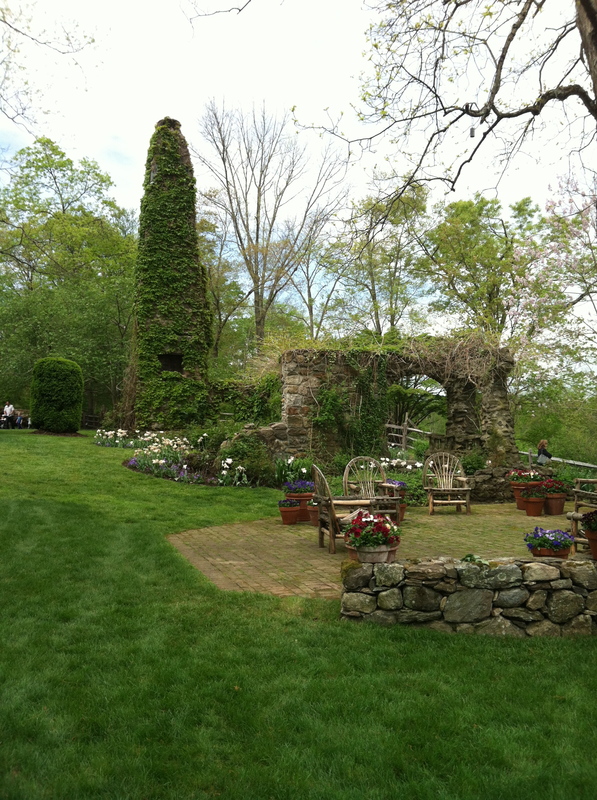 What an extraordinary garden we visited this week end! The home of Judy and Michael Steinhardt was open to the public on Sunday and it is a day I will not forget! Approaching from a very long dirt road, the 55 acre estate is near the Croton Reservoir, so you have the sense that you are about to enter a woodland paradise with water ways. 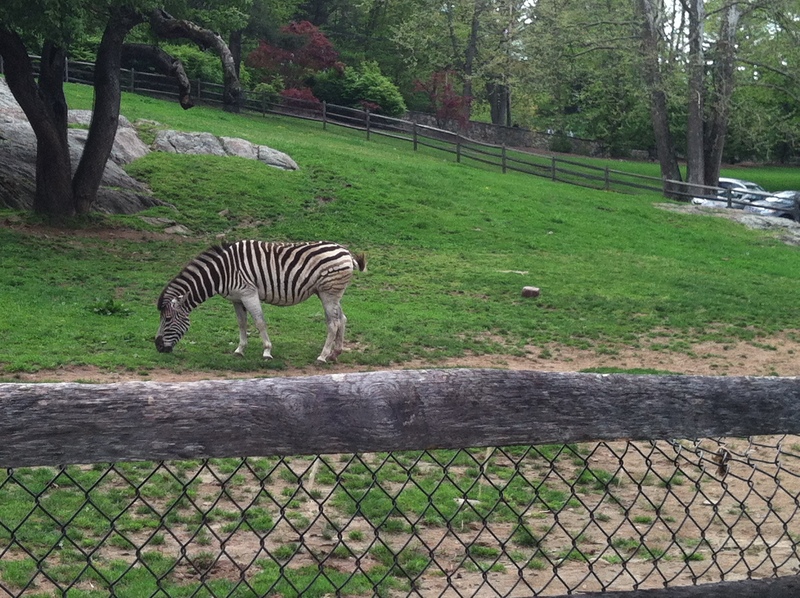 How about zebras and camels! We arrived through a beautiful gate and parked in the orchard (along with hundreds of other visitors! 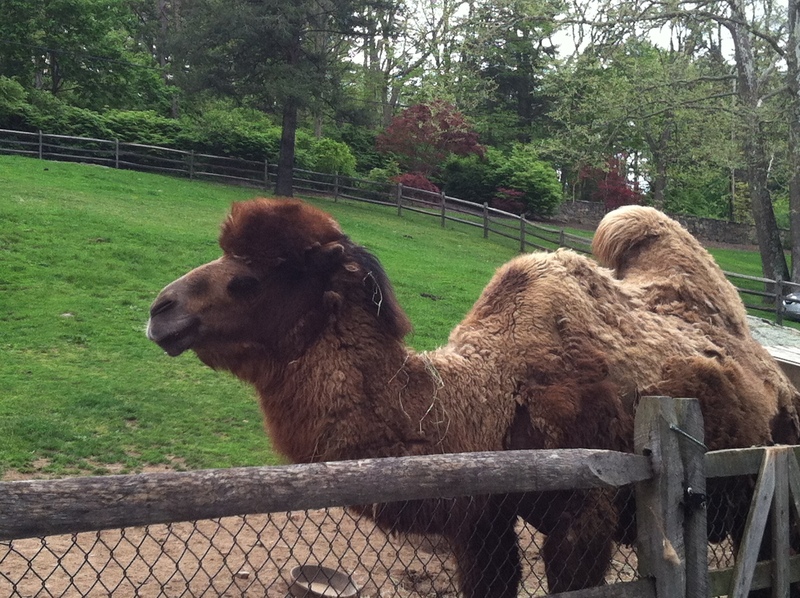 )A walk through a beautiful garden generally creates a feeling of serenity or excitement, but I laughed aloud to see these animals in a private setting – so unexpected and joyful! Our walk then took us past the waterfowl preserve, through an enormous maple grove with lotus pond, rope bridge and moss bridge skirting over beautiful waterways. Forgive this author, who left her camera at home. I can’t forgive myself! I had my I Phone with me, and it is great, but I haven’t mastered all the tricks it can perform yet! 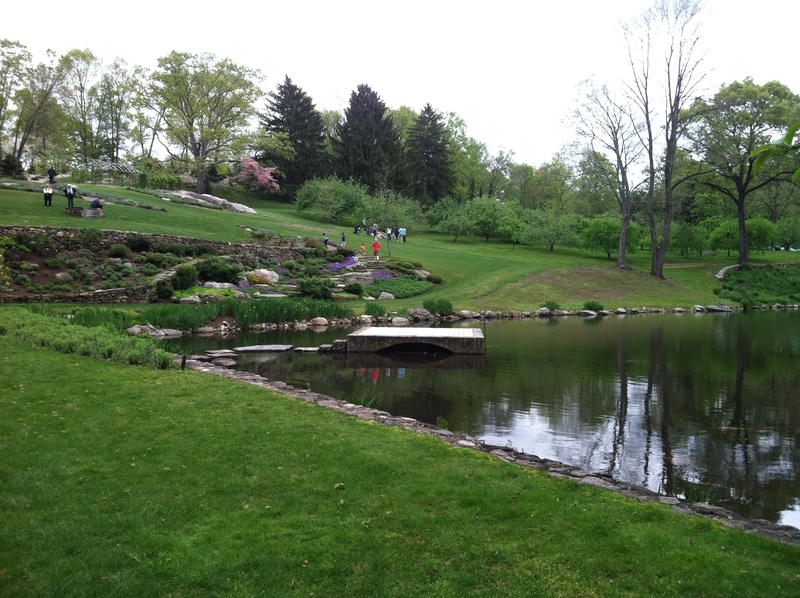 What a tremendous gift from the Steinhardt’s to share their paradise with the public. I will say that I was disappointed that too many of the parents who brought their children did not school their progeny in how to respectfully walk through someone’s garden. It is not the zoo! (One can’t blame the children, they were expressing their wonder and thrill the way children do! The parents…) Most of the children were delightful like this group who watched this giant tortoise with quiet interest. 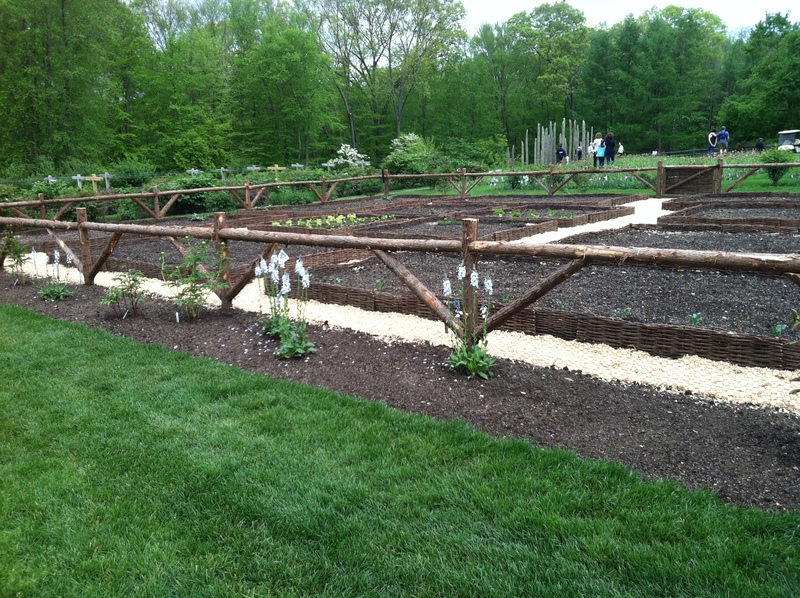 The vegetable garden was ready to accept seedlings, and it was wonderful to see the structure before the bounty. 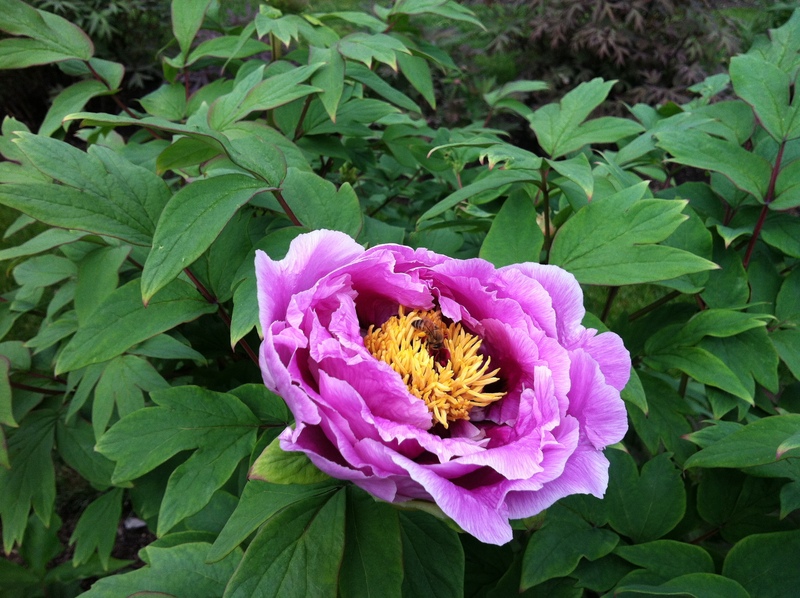 The tree peonies showing their spectacular colors. 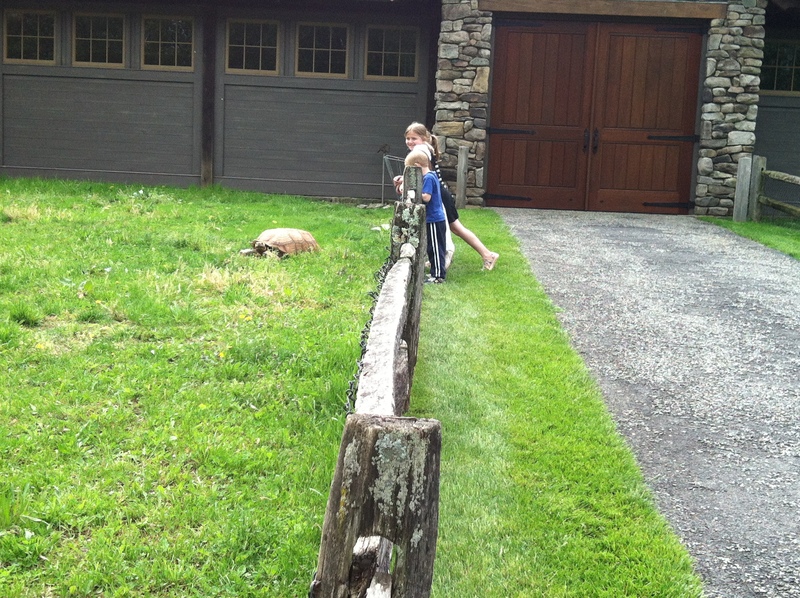 The exotic animals were in view as we toured the other side of the estate. 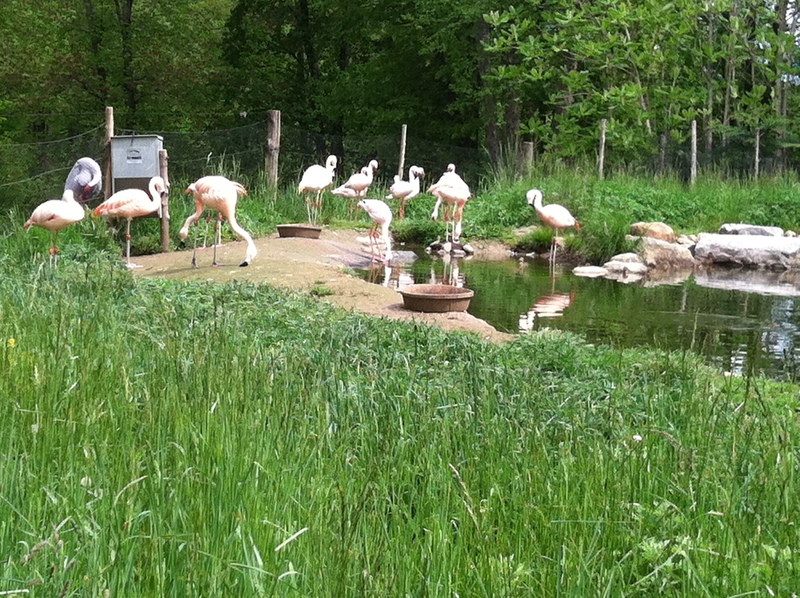 Not everyone can claim a flock of flamingos on their property! 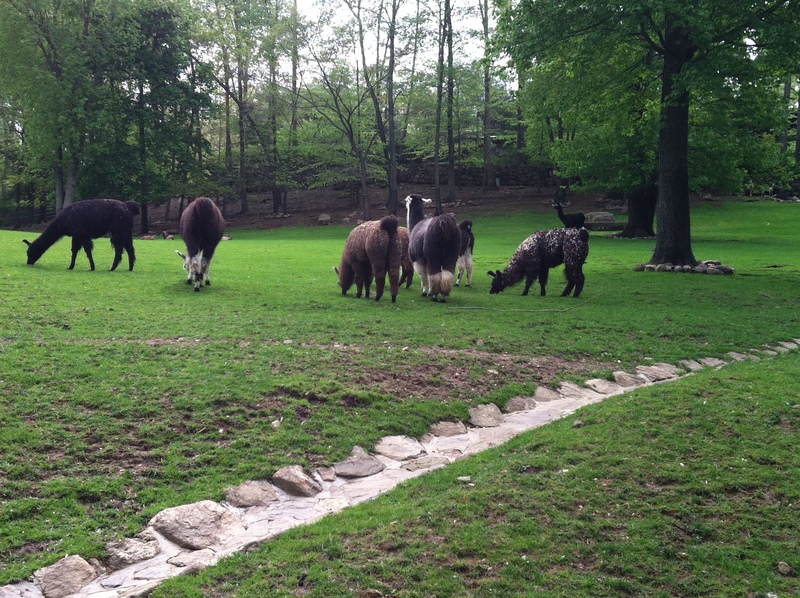 Or a herd of llamas. Approaching the barns, I was disturbed to see a HUGE wildbeast appear spooked. He was thundering in and out of his stall and galloping through his pasture. I thought the crowd might be too much, and when we left the property I saw that they had closed that area to the public. Until that moment, it was the peaceable kingdom, but they are wild animals after all. Again, I think that more respect should have been shown; the crowds did not always behave appropriately from my point of view. Soon we came to the Theodore Dreiser ruins where I could picture the owners and their guests perching to discuss the topic of the day or the pleasures and pains of having exotic animals in your backyard! All in all, a most extraordinary place. I have not touched even a small portion of what delights this garden gives, but there is a book to guide the viewer, “The Landscape Diaries: Garden of Obsession.” This garden will be open again the Autumn. I recommend wearing comfortable shoes, and leave the noisy, boisterous kids home! Thank you Mr. and Mrs. Steinhardt for a most remarkable walk through your obsession! This entry was posted in Uncategorized and tagged Garden Conservancy, Judy and Michael Steinhardt. Bookmark the permalink.